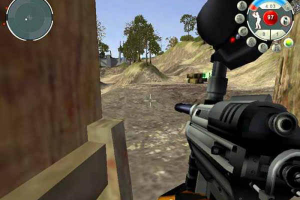 "Realistic first-person shooter paintball game"
Paintball is a very special kind of fight or combat game where you usually go with a group of friends to an open field adapted for this activity. Out there, you all will dress up with military uniforms ready to get smashed with paint balls. As it is fight where nobody gets hurt, it is just an entertainment. The only bad thing is that it requires an organization and a lot of time. So if you want to live a close experience in your computer, Renegade Paintball is a good alternative. Feel the adrenaline of running in the middle of nowhere, receiving attacks while you go for your objective. Hide behind a tree or a bunker in the forest, catch an opponent by surprise and shoot him with precision. Renegade Paintball will provide you the specially prepared fields you find in paintball fields, as well as open and virgin areas. Renegade Paintball will make you live some exciting moments also because it has some accurate graphics. You will appreciate the details in the environment. But don't lose concentration, maybe your rivals have already seen you and are about to get you covered of paint.